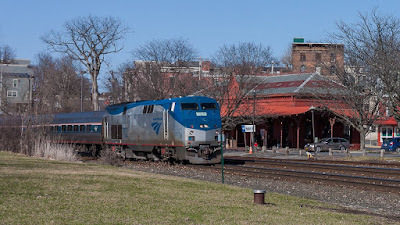 First it was the stabilization of the escarpment in Hudson, then it was fences and gates to be installed at Rhinecliff, Rhinebeck, Tivoli, Germantown, Stockport, and Stuyvesant--all in the name of safety. Now it seems Amtrak could suspend service between Poughkeepsie and New York City, making it impossible to get from here to there--and from there to here--on the train: "Amtrak May Suspend Service from Poughkeepsie over Safety Concerns." Seems they're pressuring Metro North to finish safety work they've been slow to complete, and Metro North is now swearing they'll do it. Everybody's on the case, from Chuck Schumer on down. I suspect actual suspension of service is unlikely. If this were to happen, METRO could easily run Budd cars from PK to Albany. Believe they once did back in the 60's. Enter the Budd car! Does that species exist still? First thing this city did when captured North dock from county Fisherfolk...put up a fence. Restricting rather than promoting access to a federal waterway. County motor boaters are paying city hall sixty-three cents per gallon to promote the public use of shore and instead they put up fences. Rather than manage risk they eliminate it, and along with it goes our (paid for) collective littoral liberty. I hope these same principals apply equally to Amtrak; they do for me and for all the fisherfolk I know. Railroad, Power Boat, Parachutes, CLC...city hall has a long history of abrogating their duty to promote use of the people's shore in favor of special deals to any upland riparian willing to limit/eliminate risk by blocking use. According to Americans For Prosperity, (Feb 2018) the federal government is considering an increase in the Motor Boater Fuel Tax by 25 cents, from 18 cents to 44 cents. New York now 44c/gal. From 3c/gallon in 1956 to 84 cents now underscores that access seems to be inversely proportional tax increases. More tax, less use, fewer users. Paid exclusively by county motor boaters for "improved" access, an increase to eighty-eight cents/gallon is outrageous.